The very restrained, subtle crime drama Poliţist, adjectiv (Police, Adjective) was the night's big winner at the 4th annual Gopo Awards celebrating the best of Romanian cinema. It had previously won the FIPRESCI Prize and Un Certain Regard Jury Prize at the Cannes Film Festival. I chose it for my personal top ten list for the best films of 2009. It won six of its ten nominations including Best Picture, Director and Screenplay for Corneliu Porumboiu. Cea mai fericită fată din lume (The Happiest Girl in the World) led with eleven nominations, but only received the Best Newcomer award for Andreea Boşneag. French-Belgian-Romanian co-production Concertul (The Concert) won four of its eight nominations, including Best Editing and Best Original Score. Hilda Peter took Best Actress for British-Romanian co-production Katalin Varga. The ceremony took place at the Palace of Parliaments in Bucharest on Monday. 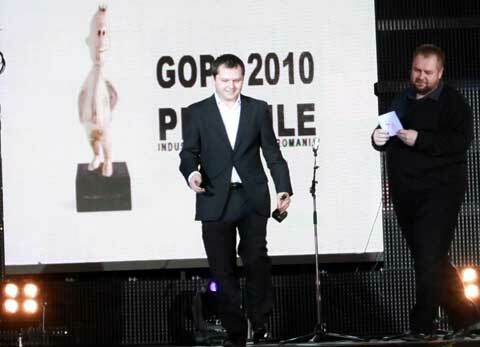 The Gopos are named in honor of Romanian director Ion Popescu-Gopo and presented annually by the Association for Romanian Film Promotion.